I painted this portrait for the BBC for an episode of Doctor Who. 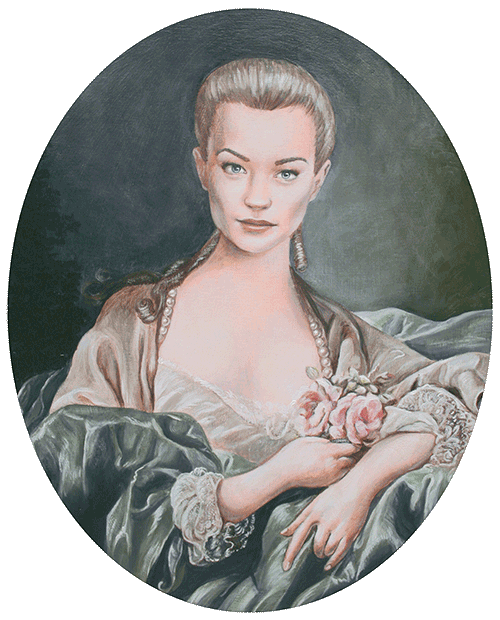 It is the actor Sophia Myles as Madame de Pompadour in the episode ‘The Girl in the Fireplace’. I used one of Boucher’s paintings of Madame de Pompadour as reference, and painted Sophia’s face using one of her publicity photos. I would’ve preferred to have photographed her in full costume and wig, but sadly time didn’t permit. It was in shot for all of 20 seconds right at the end! If you would like a print, please message me via the contacts page.